As of today the Higgs search industry is still dominated by the Tevatron; for comments on the latest results based on 8.2 inverse femtobarn see Tommaso's blog. But the LHC is catching up faster than expected. Yesterday I saw the first interesting Higgs limits from the LHC. At Moriond, both ATLAS and CMS presented the results of the MSSM Higgs searches in the ττ final state. 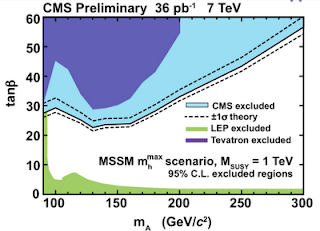 This search is of quite some interest because of earlier reports from the Tevatron: both CDF and D0 claimed a 2 sigma excess for MSSM Higgs searches in another channel with 3 b-quarks in the final state. See that they beat the corresponding Tevatron limits. 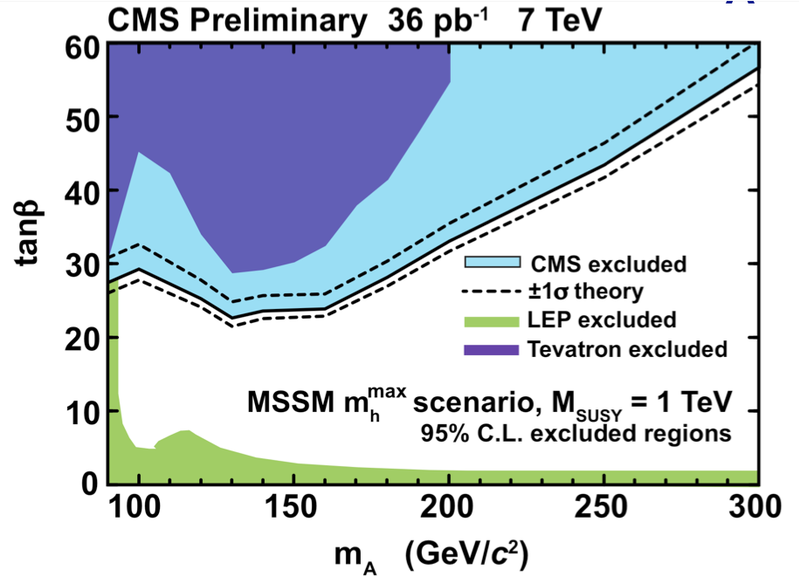 It is now clear that the Tevatron 3-b excess is unlikely to be explained within the MSSM. However, the excess can still be a hint of a more general extended Higgs sector, for example a non-susy 2-Higgs doublet model. 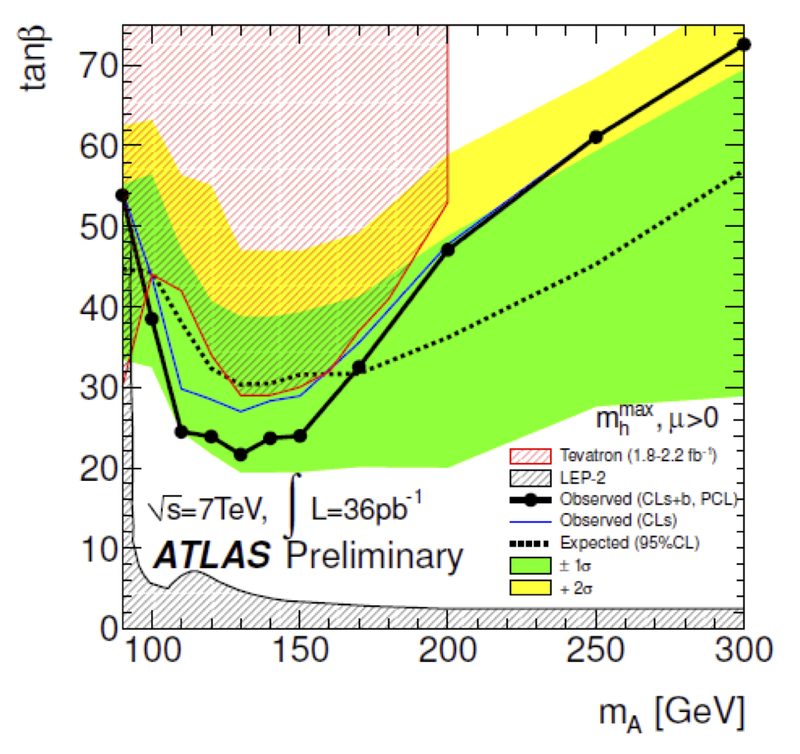 You're right that the LHC can already probe some though not all interesting Higgs scenarios. The superior detectors mean better tau-ID, leading to these impressive results. 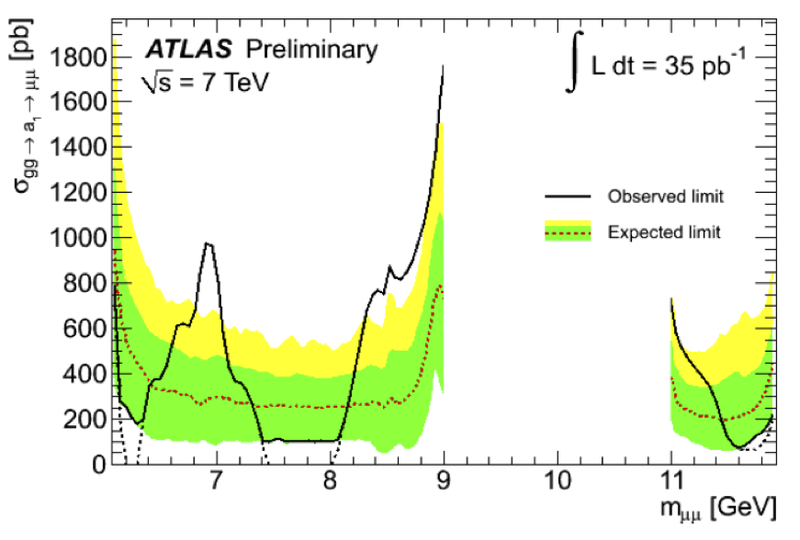 Note that the CMS result is a bit better than the ATLAS one. It will be interesting to understand why. Also, one sees here the dramatic difference between the popular "CLs" method and the controversial "PCL" method in the ATLAS plot. Kudos to ATLAS for providing both curves. Concerning the bump at 7 GeV - searches for these light resonances were conducted by CDF and no such signal was observed. So unless a new light particle is produced only as the decay product of some very heavy state, these data contradict results from CDF. The 7 GeV dark-matter bump is surely interesting given the fact that COGENT has almost claimed a 7-11 GeV dark matter particle. Michael: of course that if it is a dark matter particle, it is only produced in pairs because - e.g. a bino - it is R-parity-odd so you can't create it as a simple resonance peak from R-parity-even initial states. Hmmm... this is probably a stupid question, but why is there a blanked out at region 9-11 GeV? Is it because of background from B decays? Exactly, there are Upsilon resonances in that region, so it would be hard to search for new physics resonances there. Alternatively, the blanking of 9-11 could have been made by the Islamists... I was defending my PhD on that morning. 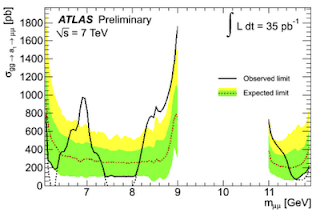 What about the peaks at about 650 GeV and 1.1 TeV in the left-hand graph on page 10 of Doug Gingrich's talk at Moriond? (Not clear if this is looking for an excited quark or an axigluon.) There are no error bars but if we assume that each dot on the curve represents a "bin", then for sigma x Acceptance around 10 pb then with 36 per pb of data, wouldn't each dot represent around 360 events? In which case the error bars will be around 1/20 of the measured values, so quite small. And the dots follow a smooth curve, so the peaks won't be statistical fluctuations. If the peaks are somehow being caused by the "acceptance", how could that happen when the heaviest observed SM object is not much heavier than 1/4 of 640 GeV? There are also events way above background at around 700 GeV and 900 GeV in the first and second graphs respectively on page 15, High Mass Dilepton Resonances (just one event in the 2nd graph, but there should be nothing there). These are clearly reflected in the large bumps in the observed limits on page 16. There is also a large peak at 400 GeV in the dilepton searches on page 4 of Francesco Santanastasio's talk, but it doesn't coincide with any of the bumps on page 16 of the ATLAS talk. That bump is suspiciously close to (M_J/Psi + M_Upsilon)/2. The three-step structure further makes me think it's the three narrow Upsilons contributing, where two muons are missed.